Michelle and I have not had the opportunity to enjoy a weekend exploring the Lower Mainland since we arrived. We spent this past weekend exploring and taking pictures. 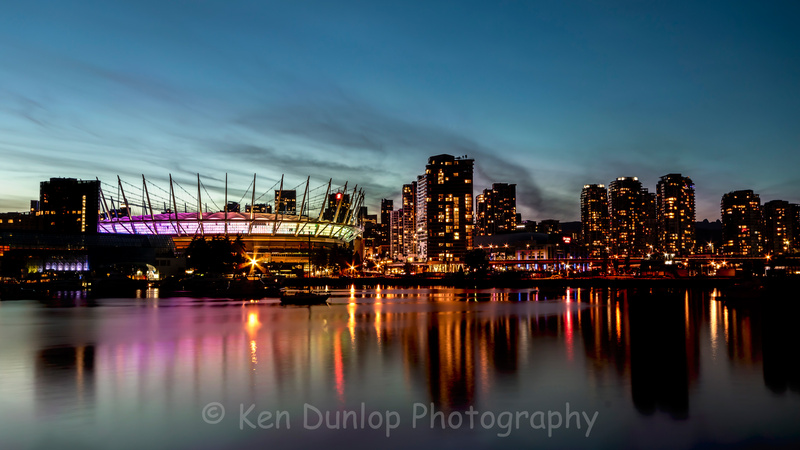 The area around the Science Centre in False Creek offers the photographer excellent opportunities for sunset images. We spent Saturday afternoon searching for my ever elusive “Honey Bee” beer from Fullers. This was one time my favourite beer which I could only find in the Lower Mainland. Finally, after searching for 6 weeks, I found someone at the BC Liquor store that was able to find 48 bottles of this fantastic brew. As is my luck, there was not a bottle at the branch I was at, but a short 15-minute drive to Cambie street, and there before my eyes was my quest! Michelle, having a craving for pizza, was telling me how I needed to find her some good pizza. Since we were near my old stomping grounds, I knew where to take her! Bella Pizza, arguably the best pizza in the Lower Mainland! We settled on the Bella Gourmet Vegetarian as the one of choice. This had been my favourite pizza and after three years it certainly did not disappoint! Living in Ontario like their beer is the land of assembly line pizza. The same taste from every pizza joint. Here in the Lower Mainland, however, there are fabulous unique flavours and tastes for those open-minded enough to give a try! We decided to use one of our previous boondocking locations for the first night. We went to St Mary’s church down off Joyce road where would go to church in the morning. I get such a kick sleeping in the van while parked on the road. Especially off Joyce there, the sounds of the city, the conversations that take place around the van no one the wiser of Michelle and I sleeping but a few feet away. There is something so cool and interesting about that. After church, Michelle and I headed to Granville Island. I did my first Photowalk there back in 2014. It was so much fun shooting around Granville Island that time, this time around since it was during the afternoon, I was there more to show Michelle around then to shoot images. I love hearing the words Michelle says when she experiencing something new. I love that she is getting to explore, something we both love to do. Sunday evening was spent down near the Vancouver Science World where I set up some of the Sunset shots I was hoping for. The area provides an excellent opportunity for the beautiful city scape images you see hanging on walls. Truth be told, some of these shots are for sale in the Granville Island stories and since we are down here, I figure we need to give it a try. We only have one tripod and Michelle knows how much joy I get from shooting landscape images she always refuses to use it, so she sacrifices her night shots for me, so try to do my best for her. I’ve shot at False Creek a couple of times, though I think this time I got my best images. I was sure we were there plenty early enough to be set for the Golden and Blue hour, and then I did some bulb exposures after it was totally dark. There is something so peaceful abuot Sunset photography! If you get a chance be sure to give False Creek a chance for your images!